The legend of the horsemen of the apocalypse goes back to the first century AD. It is a gripping image, which has transcended cultures. The best-known of the horsemen is Death, riding an ashen-coloured horse. This is the only one given a name in the original. One horseman, riding a black horse, brings famine, making grain unaffordable but leaving luxuries (oil and wine) unaffected. One horseman rides a fiery red horse and brings war. The remaining horseman, on a white horse, has lost it meaning over time. Originally, it represented conquest. In the early 20th century, the white-horse man was renamed: it became Pestilence, based on the fact that in the original, the horsemen brought death by ‘sword, famine, and pestilence’. Ever since the origin of the legend, there have been times when it seemed one or more of the four horsemen were about. There have been wars. Famine could strike at any time; it needed only one bad harvest. And epidemics, of diseases not known now, would come and go; descriptions of the symptoms sound strangely unfamiliar to us. And there was one time when all four seemed about, riding across the entire known world. It was a bad time. It was the beginning of the Dark Ages. It had been a bad time. Sixty years after the fall of the Roman empire, Europe had fragmented into dozens of small, warring states. Still, a vestige or Roman life survived across Europe. The new rulers were not barbarians (even if one tribe gave us the name Vandals), and they kept their regions functioning. Some trade continued and in some places (but not Britain) Roman land owners and their villas continued under the new regimes. Many Roman cities survived. But war was common and cities were falling in disrepair. Life was deteriorating. But there was hope of better things. The Eastern Roman empire had survived the fall of Rome. It ruled the region of Greece, Turkey, Palestine and Egypt, incorporating a substantial part of the old empire. A new, dynamic emperor, Justinian, had taken the reigns, and he was set on re-establishing the old borders. Africa and Italy were being conquered, and for the first time in a century, Rome was again Roman. The Hagia Sophia was being constructed. A new future was just around the corner. But that future never came. A decade later, Europe lay devastated, farm land fallow and cities abandoned. Instead of a renaissance, it was the onset of darkness. And it all started in the year 536. Another, unnamed Syriac chronicler writing probably later in the sixth century, adds earthquakes and storms: “And [Pope Agapetus] came with them to Constantinople in the month of March in the year fourteen ; and Severus was there and Anthemius was chief priest. And the whole city was disturbed at the arrival of Agapetus; and the earth with all that is upon it quaked; and the sun began to be darkened by day and the moon by night, while ocean was tumultuous with spray, from the 24th of March in this year till the 24th ofJune in the following year fifteen . And Agapetus, when he appeared before the king, had a splendid reception from him.” No one else mentions earthquakes or storms, suggesting a fair amount of exaggeration or false facts. Not every ancient record is true! The passage suggests that Persia and India had not been affected by the haze. There is doubt how much China was affected. There is one mention from China which may indicate a haze, saying that Canopus could not be seen. This star is very low on the southern horizon in southern China (south of 38 degrees), and can only be seen during clear weather. But apart from this indirect indication, none of the Chinese documents mention a haze or powerless Sun. This may be related to latitude. The haze was reported from locations above 35 to 40 degrees latitude. The areas that did not have the haze (Persia, India) are below approximately 35 degrees northern latitude, and this also applies to most of China. The haze may thus have been confined to higher latitudes. Michael the Syrian mentioned that fruit did not ripen in 536. Others also mention issues with food. Italy appears to have had a bad harvest, as Ravenna had to be supplied from the other side of the Adriatic which apparently had had a better harvest. John Lydos writing in Constantinople during the 540s, says “If the sun becomes dim because the air is dense from rising moisture – as happened in the course of the recently passed fourteenth indiction [535/36] for nearly a whole year, when Belisarios held the consular office, so that the produce was destroyed because of the bad time – it predicts heavy trouble in Europe.” (The reference to moisture should be discounted, as everything suggests that this was ‘dry fog’, i.e. a high altitude haze.) It mentions that produce was ‘destroyed’ – but does not state how. Priest carrying wheat. Temple of Horus, Edfu, Egypt. Much of the grain in the empire came from Egypt. The lack of ripening of fruit suggests that the summer had been very cool, presumably because of the haze. However, this would not have affected the grain (and in fact cooler weather could have been beneficial). Photosynthesis may have been reduced by the haze, but we don’t know whether the dense haze had covered Egypt. However, food production in Egypt is mostly dependent on the availability of water. The Nile obtains its water from the monsoon in central Africa. This monsoon can fail after volcanic eruptions: both the Eldgja and Laki events caused low water levels in the Nile. But the reason for the ‘destruction’ of produce is conjecture. A little more scientific training of the writers could have helped a lot! The problems in Italy became much worse. Northern and Central Italy, under Ostrogoth control, had a severe famine in 538, with one report stating that 50,000 people died. It was attributed to the fact that the land had not been cultivated during the previous year. Whether this was due to the lingering haze or to the war between the Romans and Ostrogoths is not stated. There were also problems elsewhere. Irish documents mention a ‘failure of bread’ in 536 and again in 539. The British Annales Cambriae refers to a death toll (‘mortality’) in Britain and Ireland in 537, but frustratingly doesn’t give a cause. China appears to have been severely affected. Reports mention severe drought and dust storms, but also snow, hail and frost in southern China in the summers of 536 and 537. The Nanshi (“History of the South”) mentions what follows: “famine happened in 538, and the Imperial Court decided on the 30th of the January of the year, to implement an amnesty to the tax – cut to it’s 12 southern provinces where famines were observed, especially to those who were unable to pay the tax.” (translation taken from https://history.stackexchange.com/questions/51147/what-are-some-chinese-sources-testifying-the-extreme-weather-events-of-535-536-c) The drought appears to have started in 535, which if correct means it predated the haze. A worse famine ensued in northern China. One document gives the startling number of 70% to 80% mortality among the population of one area, and states that cannibalism occurred. When studying extreme weather, it is important to check when it began. Documents tell of a severe drought in Persia in 536 (this would have been during the summer before the snowy winter). However, this drought started long before the haze. In the Levant, a very dry period began around 522, lasting several decades and which caused water shortages from Persia to Constantinople. Thus, there was environmental stress already well before the eruption. In the Roman empire, the quarter century 526-550 had the highest number of recorded famines for the entire period 100 BC to 800 AD, but these may not be all related to the 536 haze. The long-term drought may have been an important factor. Conflicts also do not help: wars and food production are an uneasy combination. The haze acerbated the effect of the drought, but by and large the Eastern Roman empire was well organized and could survive a few poor harvests. The worst famine happened in Ostrogoth Italy, perhaps because the people there had little access to food resources elsewhere. The British isles were somewhat affected. China may also have suffered from a lack of organized food distribution. This was the time of the Northern and Southern Dynasties in perpetual civil wars. The elite had better things to do than providing food. What happened elsewhere in the world is not well known, due to a lack of written sources. To know more, we needed to look into other, non-written records. And the results of those investigations were much worse than what had been expected. This really was an apocalypse. A good way to study the past is by using ice cores. These are obtained from glaciers: every year a new layer of ice forms from compacted snow, and these layers can be recognized and counted as if they were tree rings. Find a deep enough glacier, and the record can go back a long time. And the icecaps of Greenland and Antarctica are very deep indeed. The ice is very good at providing evidence for old volcanic eruptions. In the best case, an annual layer in an ice core contains tephra particles which signify an eruption and which allows the specific volcano and year of eruption to be identified. This is rare, because tephra tends not to travel far. More commonly, the eruption is indicated by sulphate. The amount of sulphate in the ice core depends on the size and sulphur content of the eruption, and on the distance from the glacier. Exact timing of the eruptions has proven somewhat difficult. The annual layers can be thin and difficult to recognize. Counting errors add up, and past a millennium can easily reach 5-10 years. Luckily, it can be calibrated using a second record of the past: tree rings. These are easily counted; the science of counting rings is called dendrochronology. By combining different tree-ring records, an accurate timing has been reached going back several millennia. The width of the rings indicate how grow-some the weather was in that year. In a bad year, there may also be frost damage inside the ring, if a hard frost occured during the growing season. And occasionally, the wood contains other indicators. Twice in the past 2000 years there was a spike in the amount of beryllium in the atmosphere, possibly due to massive solar flares. The beryllium layers can be identified both in the trees and in the ice, and can be used to bring the two in line with each other. The plot below shows the ice core and tree ring record for the period around the year 536. The top panel show the Greenland ice core, and the bottom panel the Antarctica ice core. The middle panel shows the tree rings, where green indicates the relative width of the ring and orange the change in summer temperature indicated by the tree rings. The top panel shows an impressive spike in the year 536. It was indeed an eruption. But where? Helpfully, volcanic ejecta have difficulty crossing the equator. Northern eruptions tend not to spread to the southern hemisphere and vice versa. Tropical eruptions, on the other hand, pollute both hemisphere. Therefore, comparing Greenland and Antarctic ice cores allows one to see where an eruption happened. A sulphate spike seen only in Greenland is normally from a volcanic eruption in the northern hemisphere. One present with comparable strength in both ice cores is from a tropical eruption. The spike in 536 was present only in the Greenland ice. This means that the eruption happened somewhere in the northern hemisphere, and not in the tropics. But on closer look, both ice cores showed a second spike in AD 540. Apparently, two volcanoes were involved, a northern one in 536, and a tropical one in 540. And that was a surprise. The European (Irish and Scandinavian) tree rings provided further information. A sharp temperature drop was apparent in 536, followed by an incomplete recovery. A second drop occurred in 540, and now the recovery was extremely slow: only by 550 were the trees back to normal. Clearly, the second eruption had had a major impact in Europe. But this had not been apparent from any of the written documents. Something was missing. Micheal Sigl et al (2015) rank the eruptions of the past 2500 years in terms of total amount of sulphate, converted to something called ‘global forcing’. That is a number that indicates how much of the power in sunlight is intercepted by the sulphate layer. The Sun provides us with 1000 Watt per square meter (assuming that it is directly overhead). The top-ranked eruption was in the year 426 BC, from an unknown volcano: it reduced global sunlight by 35.6 Watt per square meter. On this list, the 536 event is number 18, and the 540 eruption is number 5. If they had happened simultaneously, it would have ranked as number 3, after the 426 eruption and Samalas in 1257. The local impact on Europe may be very different from the global effect listed in the table. Regarding temperature drop in Europe (last numeric column), the 536 eruption is the top dog, and the 540 eruption ranks number 4, just after Tambora. So Europe -and the world- was hit by a double whammy, which together made for one of the worst volcanic events of the past 2500 years – for Europe, possibly the worst one. That agrees with the tree ring record in which this decade is the coldest in the northern hemisphere over the entire period. It leaves several questions. Which volcanoes were responsible? Why is the 536 eruption clear from the documents while the 540 eruption seems to have gone unnoticed? Were there effects elsewhere in the world? The answer to the second question turned out to be sobering: the disaster was clear to see – we just hadn’t connected it to a volcanic eruption. Mike Baillie, famous for his research on tree rings, for a while moved away from a volcanic cause for the 536 event. This was because originally the timeline for the ice cores did not match up with the tree ring chronology, leaving no obvious volcanic candidate. He argued that an impact with a comet could have caused the event. There are many problems with this idea, and the mismatch was eventually solved by a better ice core chronology. (If you are interested: you need a large comet to supply enough sulphur; I estimated 5 km diameter. Something that size will punch through the atmosphere, hit the ground and leave all kinds of hints – such as, where have all the dinosaurs mammals gone, and why do we suddenly have a 100-km crater in Mexico? Stratospheric sulphate would be far from the only urgent problem.) Baillie (now retired) went back to favouring a volcanic cause. The comet has gone away (they always do) – but as with Krakatoa, the story still surfaces regularly. Myths can be long-lasting. But let’s go back to the real world. Which volcanoes were to blame? There is strong evidence that there were two eruptions in short succession from both the ice cores and the tree rings. The first eruption shows up only in the northern hemisphere. The reports of haze all come from further north than 35 degrees. Further south, including much of China, the skies were apparently clearer. The tree rings which show the poor weather of 537 are also from high northerly latitudes, 50-70 degrees. Finally, although the haze was problematic and caused food shortages, there are no reports of unsurmountable problems for the Roman empire with its access to Egyptian grain. It all points at an eruption at mid to high latitude, badly affecting northern regions. The haze first appeared on March 24, 536, suggesting that the eruption happened (or started) around the ides of March. But this has not been enough to identify the culprit: we remain unclear about which volcano may be to blame. Tephra found in a Greenland ice core points at North America but not at a specific volcano. In 2018, a few tephra fragments with an Icelandic signature were found in ice cores from a glacier in the Alps, but again without a specific volcano attached. A huge explosive eruption in Iceland which could cause stratospheric sulphate for over a year would leave plenty of signs all over Iceland – nothing has been found. An effusive eruption would not put sulphates high enough to reach Constantinople (Laki did not manage this) and again, there would be a huge and obvious lava field somewhere. Iceland frequently explodes, and the Alpine tephra could easily come from other, unrelated Icelandic eruptions. Therefore, a Pacific volcano appears more likely. On the map, the eye is quickly drawn to Alaska and its arc of Aleutian islands. Is one of its islands perhaps missing? The White River Ash (Mount Churchill) has an alibi: it comes from two eruptions, one around 840 and one around 60, which are not consistent with 536. Which is a pity, because the size of the eruptions would fit the occasion: the ash even reached Europe. Was it on the other side, in Kamchatka or the Kuriles? The largest caldera-forming explosion there is dated 1650-1900 BP which almost fits: Ksudach caldera V, the second largest known caldera event in Kamchatka during the Holocene. Tephra from this explosion has been found in North America. But it is estimated at ‘only’ 20 km3 of tephra and seems a bit small and a bit too early for the 536 event. Opala, nearby, had a significant eruption around 600 AD, where the eruption column reached 20 km, but the 10 km3 of tephra seems rather small to explain the events of 536. No other smoking gun has yet been found, and neither Japan, Kamchatka or North America show other significant tephra deposits around this time. The discussion is not over, but Ksudach and Opala might be worth another look. Perhaps we should also look at the Azores. It has frequent eruptions: about one every 20 years. (The last one was 19 years ago..) The events can reach VEI6, and the islands are well placed to affect the Mediterranean. Recently it has been suggested that some of the tephra in European peat bogs that was attributed to Jan Mayen in reality comes from the Azores. But again, the smoking gun is lacking. The second eruption affected both hemispheres, and must have been a tropical eruption. And it was a serious eruption, which deposited 10% more sulphate in the ice than Tambora managed. Tree rings narrowed worldwide and temperatures appear to have dropped significantly, with several very cold years. There are no reports of haze. El Chichon has been suggested, but although it may have had an eruption at approximately the right time, there is no evidence for anything on the scale of Tambora. And finally, in 2010, a strong candidate was identified. Ilopango is the largest lake of El Salvador, up to 13 by 17 km across and 70 km2 in area, surrounded by cliffs up to 500 meter high. The beauty is bewitching, but this is the dangerous beauty of Cleopatra. This beauty hosted the largest explosion in El Salvador. The lake is a water-filled silicic collapse caldera. It is located in a pull-away graben, something it has in common with Toba. Just the water volume of the lake alone (12 km3) shows that this was not a minor event, and of course the actual explosion would have been much larger. The area is surrounded by a thick white ignimbrite, up to 30 meters thick, which extends into neighbouring countries. Most of the tephra went south and south-east. The eruption had been dated to 240 AD, until Dull et al, in 2010, measured a carbon-14 date of a charcoaled tree trunk buried underneath a pyroclastic flow, and improved the date to within the period 450-545 AD. Although not quite accurate enough for a secure identification, it makes Ilopango the most likely source for the 540 eruption. Dull et al claimed it as the source of the 536 eruption, but it is too far south for that. The volume of the eruption is estimated at 84 km3 of tephra, or a high VEI6. At 15 degrees north, it fits the requirement for a tropical eruption and an eruption this size would have affected both hemispheres. Central American volcanoes have typically a high sulphur content of 1000 ppm or more. This means Ilopango can have had 40% more sulphate than Tambora, even though it was a smaller eruption. Ilopango is a repeat offender. The oldest dated eruption occurred 1.7 million years ago. Since that time it has exploded regularly, including three events in the past 57,000 years. The largest event produced over 100 km3 of tephra. It should now be safe for quite some time (there was a minor eruption in 1880) but one may wonder about the wisdom to build the capital, San Salvador, only 10 kilometers from the caldera. The identification of the 540 eruption with Ilopango is still being discussed. Timing, location, size, and lack of any other convincing competitor, all make it a plausible candidate. But it is still possible that another volcano pops up to explain the events of 540. One may expect the largest effects from the Ilopango explosion to have been in Central America. There may have been no survivors within 50 km from the bang, based on the depth of the tephra. El Salvador was the southern limit of the Maya empire. All Maya settlements in El Salvador were destroyed. The Maya were a very long-lasting civilization who obviously knew how to survive and prosper in the rain forest environment. Over 2000 years of history, their empire showed several collapses and set-backs, including a century-long interruption from around 550, when building work ceased and some cities were abandoned. Tikal, the main Maya city of the time, was defeated and suffered significant damage. Surprisingly, Copán, much closer to the eruption, came out as victor: one may speculate that its army was bolstered by the refugees from El Salvador. The period is called the Maya Hiatus, and its start is shortly after the 540 eruption. The Maya civilization overall was less affected, and eventually there was a full recovery, although in El Salvador it took decades to centuries before a few sites became re-occupied. The Mayan had bigger set-backs at other times, which are thought to be drought-related. But the Hiatus may have been triggered by environmental stress caused by Ilopango. Teotihuacán, near modern Mexico city, was the largest city in Central America, with a population in excess of 100,000. It was one of the wonders of the ancient world. If you ever have the chance, do visit – but be careful with what you buy from the street vendors. The city was burned and abandoned around 550, apparently by its own people as there is no sign of any invasion. This is a far more significant event than the Maya Hiatus: Teotihuacán, the most powerful city in all of the Americas, was abandoned and forgotten. There is a strong case for major upheaval in the area and the 540 eruption is a major suspect. Both Tikal and Teotihuacán are well outside the tephra area. SO2 will have spread beyond the tephra, and this can kill vegetation. In this way, Laki killed the barley in western Europe. But the fact that Copán survived relatively unscathed suggests that the case is more complicated. The cold (dry?) climate of the decade may therefore have played a role in the upheaval, rather than the proximity to the eruption. Further afield, we have Chinese reports of events in this period. “the extraordinarily strange climate continued, finally the Emperor declared on November 541: Applying the Road Of Heaven in order to share the benefit of the earth’ is the old proverb by sages. Except for the lands for the Imperial Household, let us give all the abandoned lands and mulberry fields and houses to the poor. We will look into the labor power of these poor, and in accordance with it, let’s give them the appropriate size of arable lands.” The famines in southern China worsened throughout the 540’s. Let’s return to Europe. There is no indication that the weather in the Eastern Roman empire was particularly bad during 540, and no haze was reported apart from an unclear mention of ‘poisonous air’ related to the coming epidemic. If there was haze, it is likely to have been much less strong over the Mediterranean than it was in 536. But the lack of reports may in part be due to other reasons: few personal records were written during the catastrophe that enfolded in the 540’s, and those discussed more urgent events. The medieval historian Roger Wendover describes that in 540/541 there was “a comet seen in Gaul so vast that the whole sky seemed to be on fire”. That can’t have been a comet (which would have been in many manuscripts of the time), but perhaps is the 540 eruption. But the veracity of the claim is rather unclear. Tree rings at high time resolution. Source: Mike Baillie, 2015. If instead we trust in tree rings, the impact of the 540 eruption is very clear. The tree rings show that there was a pronounced dip in temperature in 536 when the climate cooled by as much as 3 degrees. This number is from Scandinavian and Siberian trees, at high northern latitudes. Further south the temperature drop may have been less. The temperature mostly recovered over the next three years, but in 540/541 there was another drop, again to 2-3 degrees below normal. This dip lasted 10 years. Note that the recovery in 542 may have been real but it may also be due to inherent year-on-year fluctuations in the data. The narrow tree rings were replicated world-wide, in data from Europe, North America and Argentina. In some places only the 540 dip was seen and not the 536 one. The 540 event was world-wide – the 536 event was not. Why did the temperature continue to decline for years after the 540 eruption? Stratospheric sulphate lasts at most 3 years before it has all returned the earth, and during this time the depth of the haze steadily reduces. Tambora caused one particularly cold year. We can speculate that the double eruption caused the cold period to last long enough to cool the Atlantic ocean, which could have prolonged the cold spell. Separately, the eruptions were large but not exceptionally so. Together they caused the coldest decade in the northern hemisphere over 2000 years, with a cooling that was 50% larger than that of the double eruption of 1809 and 1815 (Tambora). Globally, the decade was ‘only’ the third coldest. The northern hemisphere was hit hardest. The 536 sulphate haze was obvious for a full year. Models show that for the sulphate to remain aloft such a long time, the explosion must have reached a height of about 25 km. The plot (from Toohey et al. 2016) shows the predicted reduction in strength of sunlight at the latitude of Constantinople. The 30hPa line corresponds to about 25 km altitude; the other two are lower. The amount of sulphate that was used is consistent with the ice core data. Shortly after the eruption, sun light was down by 65%, and even by the end of the year it was still down by 33%. Above 60 degrees latitude the reduction was even a bit worse. The models suggest that the impact of 540 eruption would have been similar, making the lack of written records surprising but explaining the strong tree-ring signal. The effect on summer and winter temperatures is shown in the next plot, taken from the same paper. The colours show the average effect over the decade. The very large anomaly over part of the Arctic ocean is because of the expansion of sea ice, which in the simulations almost reaches Iceland. It is possible that in later years, the melting of this newly formed ice cooled the Atlantic ocean, and caused cooling up to 550. The temperature drop in Northern Europe was severe. This had consequences. Both Finland and Sweden suffered a population crash around this time with many settlements disappearing. Eastern central Sweden was largely abandoned, and according to one estimate, the population of Scandinavia halved. The cold weather is a likely cause. In high-latitude climates, farmers are normally resilient against a severe winter. (The main issue may be access to water.) Cities can be a bit more affected, especially if snow and ice prevent supplies from reaching them. Later in the Middle Ages, things became worse, and cities could quickly run out of food in bad winters. A critical point was bread: this required the water mills to run, in order to grind the grain. If the rivers were frozen, the mills stopped – and soon there was no more bread. But farming communities tended to store sufficient food to last the winter and spring. A cold summer was a much bigger problem. That meant that less food could be grown, and winter supplies might run out. Such a summer may have put an end to the Viking settlements on Greenland. Several cold summers in a row could be disastrous. Was this what happened? On the island of Gotland, off the Swedish coast, the settlements were burned by invaders. Were these invaders starving farmers from the main land? They didn’t settle: the island became temporarily abandoned. There may have been population crashes also in Germany and the Netherlands, but very little is known about this. Was it related to the climate famine? Perhaps – but there were other horsemen about. Justinian was among the greatest emperors of the Roman empire. He took power in 527 AD. At the time, the Western Roman empire was long lost, and the Eastern empire was fighting a war of attrition with the Persian empire. Justinian managed to buy off the Persian empire, albeit at considerable cost: 11000 gold pounds each year. That freed up the army, and he began to expand into the Mediterranean. Carthage in North Africa fell in 534, in a battle that ended the Vandals as a major power. The re-invigorated Roman armies invaded Italy in 535 AD and quickly took Naples and Rome from the Ostrogoths. The Ostrogoth armies came back and besieged Rome for a full year, but the Romans managed to hold the city and in 538 the Goths retreated. By 540, much of the Italian peninsula was back under Roman control. The empire was well and truly being re-established, with its new capital in Constantinople. It is interesting to guess what might have happened. On the one hand, the warring parties were evenly matched and Justinian would have had to commit many more troops to gain a lasting conquest, as he had done in North Africa. The invasion seemed half-hearted. On the other hand, if successful and perhaps in alliance with the Goths, a large Mediterranean power could have given stability and a critical mass for technological progress. Civilization could have skipped many hundreds of years, directly into the world of the late Middle Ages. It was not to be. The disease started with a fever, and within a day progressed to the classical plague symptoms. It became so bad that people reportedly started wearing name tags when going out, so that if they died suddenly they would not be buried anonymously. Constantinople may have lost 40% to 60% of its inhabitants. The empire overall is said to have lost 10 million people. The total population of the empire was around 25 million; it implies a mortality rate similar to the Black Death. Farming was badly affected, with many farms empty and abandoned. Famines followed in 542, 545, and 546. The plague had significant impacts. New wars broke out with Persia, and the man power to fight three fronts (including North Africa) was no longer available. Much of Italy had to be given up, until the Persians (whose armies were also being decimated) could be bought off again. After 550, new armies were send and Italy was conquered again, against an equally depleted Ostrogoth army. A successful incursion was made into Spain. Now the Eastern Roman empire reached its greatest extent. But the armies were much smaller, and largely consisted of mercenaries. Agathius wrote “whereas there should have been a total effective fighting force of six hundred and forty-five thousand men, the number had dropped during this period to barely one hundred and fifty thousand.” There were not enough people left to keep control of such a large empire. The economy had also become impoverished. Gold coins after 540 contained much less gold than those minted before. In 568, Italy was invaded by the Lombards and Roman control of the area crumbled. If the plague hadn’t come, it seems possible that the Roman empire would again have controlled the entire Mediterranean, and possibly Central Europe as well. That was no longer possible. Instead the empire began its slow contraction to its eventual demise, nearly a millennium later. What was this disease? The symptoms were those of bubonic plague, Yersinia Pestis. This identification has been challenged, mainly because there were some symptoms which were not present in the later plague epidemics, and because it started in Africa rather than Asia. However, DNA fragments found in graves point at bubonic plague. The plague originally came from China and it may first have spread with the westward migration of the Huns, establishing itself in the area. A different strain of this bacterium would later cause the Black Death, and a third variety caused the 1894 Asian epidemic. Over the next 200 years there were a number of outbreaks, until the disease finally disappeared around the year 750. The overall death toll over those 200 years is estimated as between 50 and 100 million. This was at a time when the world population was perhaps 300 million. What caused the sudden spread? The plague is carried by the fleas on rats, but can possibly also be transmitted through human fleas, person to person. The bacterium makes the fleas ravenous; flea bites now infect the next victim. The plague quickly became a disease of the poor. Both in 540 and in 1347, the plague followed a major volcanic eruption. In 1347, the disease spread from the Crimea, where poor, wet and cold weather was the trigger, perhaps causing rats to invade the food stores which were shipped around. In 540, the food came from Egypt with a very different climate. One paper proposes that the exceptionally cool summer benefited the Egyptian rats, and allowed their numbers to explode. Something allowed plague-carrying rats to get into the grain storage. The fact that the disease always started at the coast shows that ships carried the rats, probably as part of the grain transport. In times of shortage, there may have been pressure to ship as much food at as fast a pace as possible. Fast food can be a killer. It has been suggested that a deficiency of vitamin D, caused by the lack of sun, made the population vulnerable to the plague. This does not fit well with the dates, as the sunless year was several years before the epidemic. If 540 too was a year of haze, this was not recorded. Much less is known about the spread of the plague elsewhere in Europe. The best documentation exists for Ireland, albeit written down some 50 years after the events. The 6th century Irish invented their own word for the disease: blefed. The Annals of Tigernach mention ‘a great mortality, which is called blefed’ and which according the the Annals of Ulster arrived in 545. Nearby, Maelgwn, king of Gwynedd in Wales, was said to have died of the “Yellow Plague of Rhos” around 547. The lack of written records in Britain makes it hard to know whether the plague reached here. (There is a written history by Gildas, dated to 540, but his story is in poor agreement with what we know from other sources.) However, there is indirect evidence that there were significant changes, at the end of so-called ‘sub-Roman Britain’ (the period after the Romans had left but before the anglo-saxon became the dominant power). Whether this was due to famine or plague is not known. By 540 AD, romanized Britains remained in power in the centre, west and north, and Saxons held power in the southeast, up to York and Bournemouth. This stable situation collapsed in the next few years, and by 550 the AngloSaxon expansion resumed. The important Roman town of Calleva Atrebatum (in Hampshire) disappeared around or shortly after 550. The de-peopling of Scandinavia may have been due to either famine or plague. The former is perhaps more likely. Plague-carrying fleas need temperatures of at least 10-15 C, and this would only have been reached in summer, and possibly not at all during the decadal temperature minimum. A word of caution is needed here. It is always hard to proof exactly what happened when and why. For much of the world, we lack written documents. Archaeology rarely gives dates accurate to a decade. In Britain, we know that the cities changed and declined after the Romans left, but we don’t know exactly when they were finally abandoned. The Anglo-saxons knew the Roman cities – they build new settlements a few kilometers away. The suggestions that the events after 536 fatally weakened the remaining cities is plausible but can not be proven. In America, it is not possible to proof a link between events such as the fall of Teotihuacán and the eruptions even though it seems likely. More research is needed – especially a more precise date for Ilopango would be useful. The strongest case for catastrophe outside of the Roman Empire comes for the tree ring record. This really was a period with exceptionally cold weather. No country survives well with a lack of food. And where we have a good written record, we know that this decade was apocalyptic (Roman empire) or highly damaging (China). The fact that the timing approximately coincides with significant changes elsewhere makes it plausible that other places were also badly affected. Understanding the past is like Plato’s prisoners in the cave, who can only see shadows on the wall and from that have to infer what is happening outside. But here, the shadows seem terrifying. Ten years after the Roman empire reached its greatest promise, its future had been lost. And the catastrophe went further, encompassing China, Mexico and Scandinavia. Perhaps 10% of the world population died. The apocalypse came swiftly, unexpectedly, and without anyone knowing where it came from. Either of the two eruptions would have been survivable. The combination of the two left the world vulnerable. The four horsemen saw their chance and rode out: famine, war, plague and death attacked and destroyed the weakened civilizations. This is how the Dark Ages began. One disaster was manageable. Two simultaneous disasters became a catastrophe. And the third disaster truly brought apocalypse. Many articles can be found on these events, although few tell the full story. Scientific papers can be harder to locate. Here are some of the papers I used for writing this post. Michael Sigl et al., Nature, 543–549 (2015): Timing and climate forcing of volcanic eruptions for the past 2,500 years. A couple of corrections vis-a-vis the Justininan plague and its spread. Data now shows that the Justininan Plague was not a direct antecedent of the later plague commonly known as the Black Death, but was an unrelated strain or close cousin. There is some thought that the primary disease responsible for the mass deaths could have been a severe pandemic flu alongside the Justinian strain of Yersina, but this remains unproven. If it was indeed a different genetic variant / substrain of Yersina Pestis, it is possible that this morphed into pneumonic plague – after a few human transits Yersina Pestis will morph into a form that is spread from human to human by coughing and sneezing once a relatively small number of human to human infections through fomite transmission have occurred. The final point on this is that latest thinking attributes the spread of the plauge of the Justinian period (i.e the time frame that relates to this article) to the migration of the Hun along the silk road. BBC article here for easy reading rather than the full papers https://www.bbc.co.uk/news/science-environment-44046031. Just FYI. This is a great article, but if you really want to know what happened maybe you should consider looking at Art. It can be contemporaneous to the event and less likely to be destroyed by the book burners that regulate our history. Dr Ruth Dwyer PhD did a wonderful review of the Ravenna Mosaics on YouTube which were constructed during this event. These Mosaics show life before, during, and after the events of that dark period. It certainly looks like a comet to me. My interest in the event centres on what happened in the UK during this period; there is evidence that it took a major hit, hence the large whole in its history and the vitrified hill forts. A very good article with a critical look at the archaeological evidence for the events of 536 is by Moreland, 536: Back to nature https://onlinelibrary.wiley.com/doi/pdf/10.1111/j.1600-0390.2018.12194.x Sadly paywalled and inaccessible. I have no idea why people go to the effort of writing extensive papers – and bin them by giving the copyright to a journal which very few people are allowed to read. It benefits no one. Anyway, Moreland discusses the history of the comet hypothesis. It is based on a few extraterrestrial dust grains micron sized) extracted from the ice cores. The press releases in 2013 said the team had many grains, but the only publication I could find by the team, in a book which again is barely accessible and rarely cited, says that it is a few grains. Such grains are actually not uncommon in ice. As they find them in bot Greenland and Antarctica, they argue for a tropical impact. However, they need a 600-meter comet and that would be a geological impact leaving a 10-km crater. A water impact that size would also leave widespread evidence – none has been found. Baillie was once in favour of this hypothesis because of the lack of an acidity spike in the ice core at the correct time. When later this spike was found, he withdrew the comet hypothesis. The spike also showed that the 536 event was a northern one, whilst the tropical event was later, years after the grains of the comet team. so the tropical (ocean) impact was out and the hypothesis fell apart. I could not find any recent paper listing the comet hypothesis as a reasonable candidate. Science has swung behind the volcanic event. To revive it would require new data. 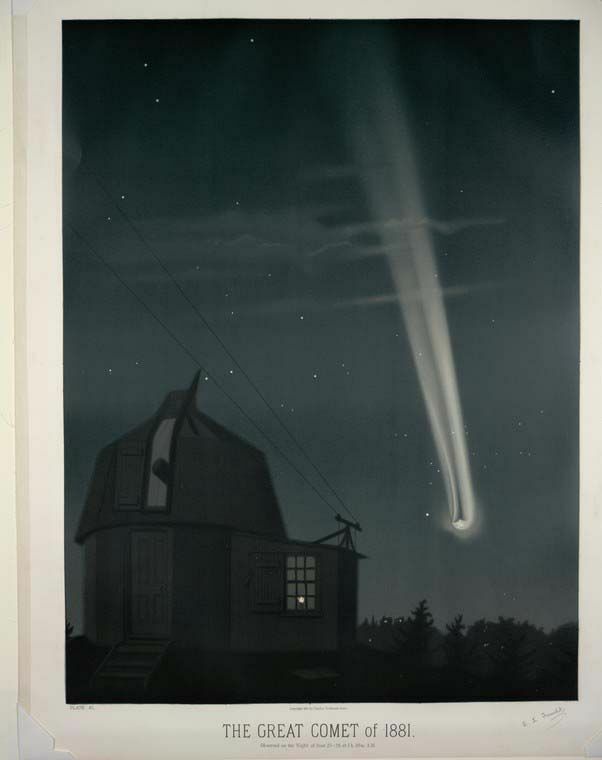 There was a comet in 530 or 531 (in fact Halley’s comet) but it was not all that bright. Another comet came 8 years later, again notable but not brighter than usual. Neither fits 536. Two comets in a decade is not unusual. But again, the ice cores indicate volcanic events. If only we knew for sure which volcanoes! How about an early offspring of the originator of the Kreutz sungrazers? Comet Ikeya–Seki is supposed to be one of the current offspring of that family. I don’t know the periodicity, but X/1106 C1 is alleged to be the progenitor and observed to have a fracture event that year (1106). An earlier fragmenting episode would not be out of the question. Paywall research is a crime against science. Never pay for papers. If necessary, contact the authors to ask for a copy, or ask an academic somewhere who has access. You’re not meant to pay the price: you are meant to be put off by the price, which forces the university libraries to subscribe. That is how the publishers make money. Note: I am not being nice in this comment, just pragmatic. Essentially, they are the vampires of the academic world. And if you find “vampires” to be offensive, try “pushers,” that works just as well. results in peer-reviewed journal, you’re stuck with the official channels. If you simply want reliable information from which to draw conclusions, or are doing non-academic writing, not so much. Thanks for this very interesting summary of the last >20 years of research. While the culprits for these two eruptions remain unknown, Mt. Churchill is off the hook: Geochemical, age, and morphological evidence showed that the Alaskan White River Ash (eastern lobe; A.D. 833–850) correlates to the “AD860B” ash found in two different ice cores from Greenland and in northern Europe. The best age estimate is A.D. 853. Jensen, B.J.L., et al. 2014. Transatlantic distribution of the Alaskan White River Ash. Geology, 42(10): 875-878. Toohey, M. and Sigl, M., 2017. Volcanic stratospheric sulfur injections and aerosol optical depth from 500 BCE to 1900 CE. Earth System Science Data, 9(2): 809-831. But we should not expect it to be too simple! We still have no idea about the culprits of large eruptions in 1809, 1695 or 1453. Chapter XVI–Pascentius and Gillomanius are killed in battle. Uther, though he doubted of the truth of what Merlin had declared, pursued his march against the enemy, for he was now come within half a day’s march of Menevia. When Gillomanius, Pascentius, and the Saxons were informed of his approach, they went out to give him battle. As soon as they were come within sight of each other, both armies began to form themselves into several bodies, and then advanced to a close attack, in which both sides suffered a loss of men, as usually happens in such engagements. At last, towards the close of the day, the advantage was on Uther’s side, and the death of Gillomanius and Pascentius made a way for complete victory. So that the barbarians, being put to flight, hastened to their ships, but were slain by their pursuers. Thus, by the favor of Christ, the general had triumphant success, and then with all possible expedition, after so great a fatigue, returned back to Winchester: for he had now been informed, by messengers that arrived, of the king’s sad fate and of his burial by the bishops of the country, near the convent of Ambrius, within the Giants Dance, which in his lifetime he had commanded to be made. For upon hearing the news of his death, the bishops, abbots, and all the clergy of that province, had met together at Winchester, to solemnize his funeral. And because in his lifetime he had given orders for his being buried in the sepulcher which he had prepared, they therefore carried his corpse thither, and performed his funeral rites with royal magnificence. Chapter XVII–Uther Pendragon is made king of Britain. There’s also a fair amount in Beowulf which could be tied into a narrative of the disasters, at least partly of volcanic origin, which plagued the mid sixth century. The historical battle which chronologically precedes most of the action and is attested in other sources is pre-536, and the general depopulation of the Baltic area forms a backdrop to the final dragon battle some 50 years later. I have not seen a suggestion that the fire breathing dragon itself represents a comet or meteor but its origin, from a disturbed barrow, an association with some dimly remembered former disaster, does suggest a periodic comet. And just to meander a bit off topic – King Arthur was a Dux Bellorum under the Romans. The Scythian mounted archers were brought to Britain to patrol Hadrian’s Wall. It was another thousand years before battles took place again on horseback. Arthur is a name with possible meanings. Arth is bear in Welsh. Artyr means son of the ancestors in Kazakh. Apples come from Kazakhstan. They appeared 6000 years ago in Alma Ata which means mother of apples. The same legends include the lady in the lake, the miraculous sword, and the holy apple groves and there is a Roman villa near Glasgow with mosaic flooring that would match a very large round table and seating arrangement. The Saxons were invading at this time, and the Britons were pushed further west until the battle of Chester when 10,000 died and they were pushed back into Wales, where the language survived. So it is ironic that the Kazakhs defeated the Scots again – 3-0 in football this week…. Thanks Alyson. You always find these fascinating sources! The comet in this story may be based on the one in 1066, as the story was written in the 1100’s (probably using oral stories that circulated). There were comets in the 530’s but none as bright as the one referred to here, and in fact no particular bright comet was reported for that entire century. I know, Albert, I have a few bees in my bonnet. The history of those early days is obscurely recorded. St Columba is another source: Born in Garton, County Donegal, Ireland, c. 521; died June 9, 597. When Padraic had banished and driven away all the evil spirits from Cruachan Aigle that is today called Cruach Padraic, there went a throng of them to the place that is now called Senglenn Colmcille in the region of Conall Gulban to the north. And they were in that place from the time of Padraic to the time of Colmcille. And they raised a fog about them there, so that none might see the part of the land that lay beneath the bog. And of the river that forms a boundary to the north they made a fiery stream so that none at all might go across it. And who should touch of that stream little or much, he should die immediately. And the angels of God revealed this thing to Colmcille. And he went with many others of the saints to drive away the demons and banish them out of that place. And they made a stay beside the fiery stream we have mentioned. And they had not been long here when the Devil hurled a holly rod out of the fog across the stream. And it killed An Cerc, Colmcille’s servant, with that cast, so that Srath na Circe is the name of that stream thenceforth. At that Colmcille was exceedingly angry and he seized that same javelin and hurled it across the stream. And the land was yielded to him for the space the javelin went into the fog, for the fog fled before that cast of Colmcille’s. And that javelin grew in the place where it struck the ground, so that today it is a fresh holly-tree, and it has not withered from that time until now, and thus shall it be till Doomsday. Then Colmcille blessed that stream, and its venom and enchantment departed from it. And he crossed it. And an angel brought him a round green stone, and bade him cast it at the demons, and they should flee before it, and the fog also. And the angel bade him throw his bell Dub Duaibsech at them in the same way. And Colmcille did as the angel commanded him so that the whole land was yielded to him from the fog. And the demons fled before him to a rock out in the great sea opposite the western headland of that region. And Colmcille cast at them that stone that the angel had given him, and his bell Dub Duaibsech. And he bade the demons go into the sea through the rock where they were, and be in the form of fish forever, and to do no devilry against any thenceforth. And by reason of the word of Colmcille they must needs do that. And a man having on his armour might go through the hole they made in the stone when they went through it into the sea. And lest folk should eat them, Colmcille left a mark on them passing every other fish, that they should be blind in one eye and red. And fishers oft take them today, and they do naught to them when they perceive them, save to cast them again into the sea. Then Colmcille required of God to give back to him his bell and stone from the sea. And lo, he beheld them coming forward him in the likeness of a glow of fire and they fell to the ground fast by him. One more potential candidate for this or for other very large tropical or NH “unknown” eruptions. Not sure why that link does not seem to work but if interested, search that report name/citation. The search of the citation finds at least one publicly available PDF version. It is a really interesting paper that was written 7 years before Nabro actually erupted again.